Appenzell Whitework Embroidery Video – Worth Watching! If you love All Things Embroidery, and especially if you love whitework embroidery, you’ll definitely enjoy the following video on Appenzell whitework! Appenzell is a region in northeast Switzerland, famous in the embroidery world for very fine whitework featuring many types of stitches, openwork backgrounds, floral motifs, and sometimes, figures. Before industrialization in Switzerland, the fine whitework from Appenzell was worked entirely by hand, as a cottage industry. In the following video produced by Appenzellerland Tourism, the story of the Appenzell whitework is told. The video is in English and is just short of 30 minutes long. It’s definitely worth watching! Email Subscribers, you can watch the Appenzell whitework video here. You can also find it on YouTube in German and French, on the Appenzellerland Tourism YouTube page. Thanks to Jessica Grimm for pointing out the video on Facebook. Who is Jessica Grimm? She’s an RSN graduate located in the western Netherlands. She runs lots of workshops, so if you’re in the area and looking for instruction, you might contact her! In any case, she has a nice website and she posts lots of interesting embroidery stuff on her Facebook page, Märchenhaftes Sticken. That picture at the top of the page is quite pretty! Thank you for posting the video. Interesting. I wish they had featured more pictures of the embroidery projects. The work was so beautiful. Wow they really worked hard and their work was outstanding I loved their hoops they looked like thick belts, imagine spending hours and hours sitting embroidering it’s a wonder they didn’t go blind. It’s so interesting that they didn’t do any other work to conserve their hands because the embroidery meant much needed money for the family although what they earned was pittance compared to what they would earn today with such detailed work. This is a really interesting video thanks Jessica and thanks Mary for sharing this with us. Thank you Anita! I was prompted to google for Appenzeller Handstickerei bei my good friend and fellow RSN graduate Marina Berts. LOL, you are welcome Paula! And many thanks for your praise. How wonderful. That collar later in the video is scrumptious. I’ll certainly have a deeper respect and gratitude for the embroiderers of the past now, especially those who worked in these conditions. We have our magnifiers and daylight lamps, ergonomic chairs, music at the touch of a button and companionship and help through groups and classes actual and online. Practice, practice, practice. They perfected the art of candle lit perseverance that brought forth almost unimaginable fineness and beauty in their embroidered works. Thank you for this valuable insight. Loved the video. Certainly telly the story of the ‘work’ of what we now use for personal inner fulfillment. I doubt that many of us depend entirely on our needlework for support of a family. Well done. Thanks for sharing. Wonderful video Mary. Thanks for presenting it to us. OMG can you believe the skill of those women. I could easily relate as my mother-in-law started hand sewing at age 4 from her mother’s instruction. thank you for upholding the tradition and teaching us all! Awesome video! Such beautiful work! Thank you! 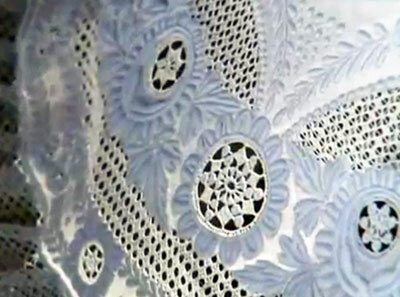 Thank you so very much for sharing the Swiss white embroidery history. Altho’ I will probably never do any of that I love to learn what is being done in our world. I just wish I had been exposed to so much earlier in my life. Bless you in all that you do for us. beautiful video. Someone sprayed something after the embroidery pattern was trace, do you know what is that?? I like the belts around the hooks…good idea, and poor peoples eyes. I love embroidery, but I don’t think I would be all day sitting doing it. Wow, that stuff is gorgeous. I have a couple of thrift store handkerchiefs that are probably imitations of this style. Mary, do you know what kind of thread or size of needle is required to pull this off? Different weights of whitework thread were used. The really fine whitework threads (like size 40 and above in mercerized cotton) are no longer made. Coton a broder (size 16 – 35) would be the recommended thread for this type of whitework; however, if you want something really fine, then you might have to resort to floss, or, for some of the techniques (like the pulled or drawn work), linen thread in the higher numbers. Do you think hairspray would work? I probably wouldn’t use hairspray… there’s too much “other stuff” in it. Thank you for this latest video. Very interesting and beautiful. I enjoy your website so very much. Thank you for sharing this. I was really touched by the statement that only the well-off could afford to embroider for themselves. Such an interesting video. How those people worked hard to make a living. I loved the views of the whitework. So pretty to look at. How we take things for granted today, with all the technology and machinery to do the work for us. Thank you so much Mary for bringing this video to us. I loved the video, Mrs. Corbet. I love history. Amazing how dedicated they were to their work and how hard they worked on it. Just beautiful. That was a fascinating look into the life of a cottage industry! “You could only afford to embroider your own collar if you were better off.” Such exquisite work, too. I wonder if the Appenzell embroiderers remaining in 1998, when the video was made, are still stitching and perhaps sharing their skills today? Wonderful video, beautiful work and the music was lovely too. Thank you Mary and Jessica! Yes, Catherine, some still are and it is still possible to learn this type of embroidery from regional teachers: http://www.landhand.org/angebote-landhandwerkerinnen/appenzellerland-ch/kursstoebli-appezoell-appenzeller-handstickerei. Thank you so much for sharing this video, I really enjoyed it. It’s amazing to think of women doing such difficult work under such conditions. I guess we should be very grateful for our lives today. Thank you for this, Mary. I adore Appenzell embroidery and this was a poignant lesson in both the technique and the history of it. Thank you for sharing the great video on Appenzell, I enjoyed it so much. Silly me, but this video brought tears to my eyes. I think about the eye strain and simple exhaustion those women and girls must have endured, embroidering at that level of skill for that many hours a day under those conditions, simply impossible to imagine in this day and age. We look at costumes, particularly from the Victorian era, in museums and think, how lovely, but then move on to something else, not really thinking about all those women who were such artists with a needle who created such beauty under really primitive conditions. We have our high intensity lights, they had a kerosene lamp focused through a bowl of water to spotlight an area of their work. Unimaginable! Thank you for the video, I have learnt so much history and traditions from your site. Truly inspirational tutorial, the skills and dedication of the women humbles our lives today. You are very welcome Kathryn! I hadn’t heard of it either. My good friend Marine Berts pointed it out to me. She is lucky enough to live in Switzerland and learning the technique at the moment. Thank you – the video was so special. Leaves one appreciating even more all we have now. I was fortunate in being in St. Gallen earlier this year ( our son works/lives nearby ) and visited the Textile Museum. The Library is something totally unexpected – anything and everything to do with embroidery is recorded, catalogued and/ or preserved there.